Recently Grace and I had the joy and privilege of sharing with the folks in New Dawn about the work of United Grace Mission UK. India is a tremendous mission field. In 1793 when William Carey went the population of the world was 1 billion, today the population of India is 1.2Billion and growing fast. The fastest growing nation on earth. More than 2,500 people groups, speaking 1,600 languages & dialects. The average family exists on less than £2 per day. The mission was founded in 1998 by the late Pastor Tom Orr from Carrickfergus after he had retired from over 50 years as a servant of God in three churches, Killyleagh Baptist, Shankhill Baptist and Rathcoole Baptist. 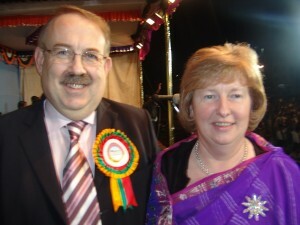 The work is now carried on under the leadership of a team of unsalaried directors of which Pastor Lawrence Kennedy (Ballee Baptist) is chairman. We have since our foundation taken as our motto “we reach, we preach, we teach, we care for India’s millions” and we do this by making regular trips to the field and by supporting indigenous workers. Our latest trip was in March, when a team of 5 went out led by Pastor Kennedy. We had gospel meetings, pastor’s seminars, children’s meetings and a women’s outreach .This can be difficult at times as India is a Hindu nation and the gospel is not always accepted. If we went and preached that Salvation by faith was another way to get to Heaven there would be no problem, but when we say that “Jesus is the only way”, then the radical Hindu’s, object. Christian missionaries were banned From India in 1964, so when we go out on field trips we have to be ultra-careful. But in spite of this God is working in a mighty way and many souls are being added to the Church daily. We as a mission work closely with Bible Education by Extension International in training our local pastors. They are currently engaged in this course where they meet on a regular basis for intense teaching, complete home assignments etc. under the guidance of Pastor Babychen who is the regional director for BEE. We have now joined in partnership with The New India Evangelistic Association to build a new home for differently abled children in Paippad Kerala. This home is being built in memory of our late son Jonathan, also Mark and Catherine’s older brother who was called home in 1999.The home will provide residential care for up to 10 children suffering from Cerebral Palsy, day-care facilities for up to 15 children with the same condition, counselling services for carers and parents of the children, and occupational therapy centre will also be included. These are exciting times for the Mission and we would ask you to join us as prayer partners as we seek to serve God in the Land of India. We are truly thankful to have had the opportunity to visit New Dawn and we felt the warmth of welcome and support when we were with you. Send us your details and we will be happy to send you our quarterly newsletter. Our even better send us your email and get our monthly updates.